A 4.0 magnitude earthquake struck the San Francisco Bay area early Monday morning at a depth of 3.1 miles, the U.S. Geological Survey reported. Witnesses said that the tremors could be felt most strongly in the East Bay near Oakland and Berkeley, but less so in downtown San Francisco. It was a lucky break for the Golden Gate city, where no injuries or major damage were reported (only the BART transit system reported very brief delays), though it could have been much worse. 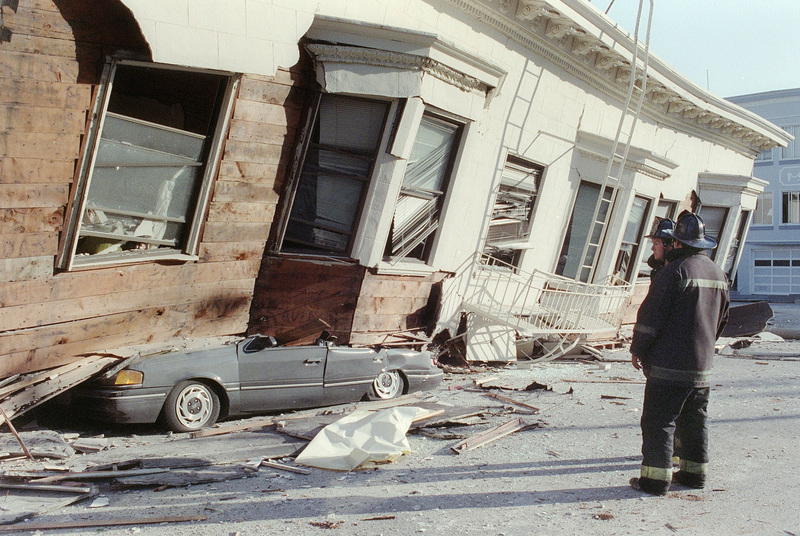 As the Los Angeles Times pointed out, San Francisco is one of several cities around the world at risk of a mega-earthquake, due to its position along California's Hayward fault line — and it's not the only big name on the list. "[This ] is earthquake country, and residents should live every day like it could be the day of a big one," explained USGS geophysicist Ned Field, who authored a study on the topic of global mega-quakes back in March. The likelihood of a large quake hitting the United States' San Francisco Bay area, he explained, was actually higher than researchers had previously realized. "As the inventory of California faults has grown over the years, it has become increasingly apparent that we are not dealing with a few well-separate faults, but with a vast interconnected fault system," Field wrote in his report. "Tectonic forces are continually tightening the springs of the San Andreas fault system, making big quakes inevitable." It's not just in the United States either: Around the world, the inevitability of a major earthquake increases with each passing year. So which of our global neighbors top the list of countries most likely to be hit? "You can pretty much pick a continent, and find a city or a country [at risk for big quakes]," said USGS Research Geophysicist David Wald, in an interview with CNBC this past April, following the devastating 7.8 magnitude quake in Kathmandu, Nepal, which he cited as a prime example. Safety standard-deficient countries are "100 to 1,000 times, even 10,000 times, more vulnerable than a place like California" as well, he said. Here's just a shortlist of the countries at highest risk of being struck by a mega-tremor in the near future. Because it sits right on top of the border between the Indian and Eurasian tectonic plates, the region surrounding Islamabad is at increased risk for destructive tectonic activity, like the 7.6 magnitude quake that struck in October 2005, leaving 73,000 dead, and the September 2013 7.7 magnitude quake, which killed 370 in the southwestern Baluchistan province. The last quake to hit Islamabad was a 5.1 magnitude tremor in July, which did little serious damage. Here's hoping that the trend of less violent quakes holds up. Because Lima is located between the Nazca and South American tectonic plates, which pass by one another at a rate of approximately 3 collective inches per year, it's a veritable hot-spot for seismic activity. The most recent headline-grabbing earthquake occurred in April this year, when a tremor between 4.9 and 5.2 in magnitude struck off the coast. Thankfully, no one was hurt. But the region has been hit by monster disasters before, namely the Ancash earthquake in 1970, which killed as many as 70,000 people. The quake also triggered one of the largest and deadliest avalanches ever recorded, burying the nearby towns of Yungay and Ranrahirca in over 80 million cubic meters of ice water, mud, and rocks. In the past few decades the city of Lima has managed to recover from a series of similarly tragic quakes, including one in 2007 that killed over 500, but the hits seem to keep coming. For an area of the world prone to such behemoth quakes, citizens must be in constant watch-mode. Perhaps one of the most notorious earthquakes in recent history was the the 2004 quake off the coast of Indonesia's Andaman Islands, which triggered a monster tsunami and killed 225,000 in Indonesia alone before sweeping across 14 separate nations and bringing the overall death toll to nearly 300,000. But Jakarta is no stranger to large tremors either: In 2007, a magnitude 7.5 quake struck just 65 miles outside the main city at a depth of 180 miles, shaking the city of 9 million residents violently and leaving them panicked in the streets. Fortunately, no one was killed, and seismologists indicated that the depth of the quake itself had prevented it from triggering any major tsunamis. In the future, given the city's prime location in the so-called "Ring of Fire" — the line of volcanic and seismic activity zones which surround the Pacific plate — it may not be so lucky. One of the most seismically active regions in the world, Iran sits atop several fault line networks, leaving it open to devastating consequences. In 2002, a 6.3 magnitude quake struck the capital city of Tehran, toppling infrastructure and burying scores of victims under piles of rubble. In total, the quake killed over 200 and left survivors stranded in the cold night air for hours. Since the mid-1700s, Iran has suffered through nearly 40 separate major quakes that leveled buildings and killed hundreds of thousands. Speaking with The Huffington Post in April this year, Oregon State University professor Chris Goldfinger explained that the the reason for the high fatality rate prevalent in the Tehran region specifically had to do with the dangerous pairing of low construction standards and high risk. "There's a big strike-slip fault, much like the San Andreas, there that's just offshore of Istanbul [and] Tehran," he said. "There are a lot of cities like that — that are relatively low construction standards and relatively high hazard level." On April 25 this year, a massive earthquake shook the Kathmandu region of Nepal, crumbling sacred buildings and killing over 9,000. It was noted as the worst natural disaster in the country's history since the 1934 earthquake which killed as many as 10,000 and registered at an 8.0 on the Richter scale. Subsequent after-shocks registered as high as 7.3, taking the lives of an additional 3,500 civilians or more. The initial quake also triggered dangerous avalanches on nearby Mount Everest, were several climbers were killed as well. Geologists have declared the region especially unstable due to its hazardous location on the Indian and Eurasian tectonic plates — like Pakistan — and have warned that future quakes could be even worse than the terrifying tremors this past spring, given that the region of Kathmandu itself sits atop a 300-meter-deep layer of clay, which focuses seismic waves and makes them even more destructive. "It was sort of a nightmare waiting to happen," said University of Cambridge seismologist James Jackson of the April mega-quake, in an interview with Al-Jazeera. "Physically and geologically what happened is exactly what we thought would happen."